Arrive at your wedding or special event in the grandeur of the most luxurious car on our fleet, our Vintage Silver Cloud 1 Rolls Royce. We do winter weddings, too! 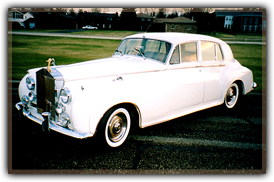 A Dynasty Rolls Royce and Limousine has been in the business since 1990 at the same location and with the same name. Since A Dynasty does only weddings and special events, shouldn’t we be doing yours? Be sure to call us for the special events in your life: Weddings, Anniversaries, Birthdays and Proms!